Apple iPad Charging Solution for iPad, iPad Mini or iPad Pro 12.9"
Multiple iPad Mini Charging Station stores, protects and charges 20 Apple iPads, iPad Minis, or iPad Pro 12.9". iPad Pro 12.9" charging station option is compatible with the new iPad Pro with USB Type-C connector. Charging station has wheels and pull handle for easy transport. iPads are charged by connecting Apple charger/cable to power surge protector. *Case lid must stay open while iPad's charge. 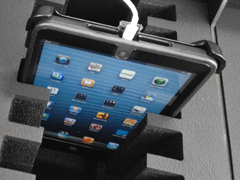 Foam protection keeps iPad Mini's secure. *iPad, Apple charger/cable, and iPad cover are not included. 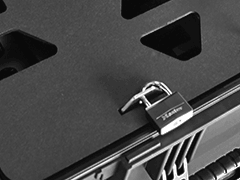 Lockable door provides theft prevention meanwhile iPad Mini's charge. Video shows how iPad Mini Charging Station works. 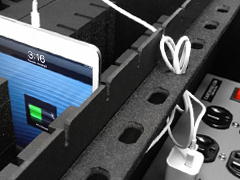 Custom iPad Charging Station is designed to fit your specific needs. Fitness Tracker Charging Station charges 25 heart rate trackers. iPad Carrying Case allows for shipping of up to five iPads and chargers. Ten Pack iPad Charging Station is perfect for classrooms and tradeshows. iPad Carrying Cases designed for transporting up to twenty iPads or iPad Minis.